Interior design is easy when you add this high quality Artistic Weavers Nickerie area rug to your home. Made from plush synthetic material, this indoor rug is high quality and extremely fashionable. Since it is machine-made, you can trust the quality on this rug. This oriental patterned red rug makes a contemporary mark on your home's interior design. 5 ft. 3 in. X 7 ft.6 in. This modern Artistic Weavers Bradbury area rug will instantly improve any room you place it in. Decorate the right way with this indoor piece constructed from plush wool material. This rug is hand-made for convenience and quality combined. You and your guests will enjoy the lovely oriental pattern that decorates this red rug. Improve the overall interior design of your living room, dining room, or hallway with this Artistic Weavers Frutillar area rug. Crafted to be an indoor piece, its plush synthetic material is unique and comfy at the same time. Keep this hand-made made rug in your home for a long time. Quality comes first in this geometric patterned red rug. Modern and stylish, this Artistic Weavers Lacombe area rug is a quality accent piece. Designed to decorate an indoor space, this plush synthetic material rug is high quality. Make a lasting style statement with this machine-made rug. 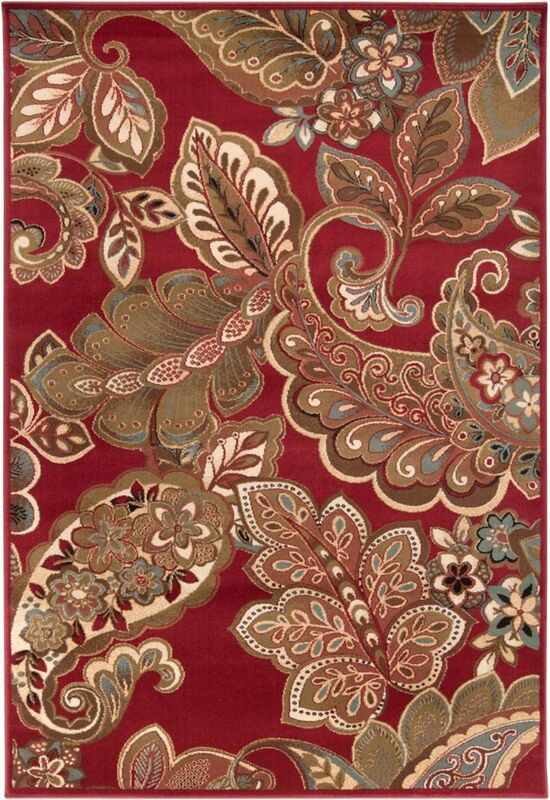 Quality is assured with this floral plants patterned red rug. Include this Artistic Weavers Tropica Harper area rug in your hallway, dining room, or living room dicor for a taste of modern style. Quality meets modern style in this indoor rug made out of plush jute material. Keep this hand-made made rug in your home for a long time. Include this solid patterned red rug in your living spaces for a high quality and high fashion look. Nickerie Red 5 ft. 3-inch x 7 ft. 6-inch Indoor Transitional Rectangular Area Rug Interior design is easy when you add this high quality Artistic Weavers Nickerie area rug to your home. Made from plush synthetic material, this indoor rug is high quality and extremely fashionable. Since it is machine-made, you can trust the quality on this rug. This oriental patterned red rug makes a contemporary mark on your home's interior design.